Your FICO score is the branded version of your credit score most widely used by the nation's largest banks to make credit and loan approval decisions for applicants. FICO sells 27.4 million scores a day and is used for 90 percent of all lending decisions in the United States. FICO was founded in 1956 by engineer Bill Fair and mathematician Earl Isaac and originally was named Fair, Isaac, and Company. The original goal, according to its website, was to improve business decisions by using data intelligently. They developed their first credit scoring system in 1958. In 1991, FICO scores were made available at the three major credit reporting agencies, and by 1995, Fannie Mae and Freddie Mac were recommending the use of FICO scores for mortgage lending. In 2009, the company officially changed its brand name and stock symbol to FICO. As of 2018, the most recent version of the FICO score, FICO 9, eases the impact of medical debt on consumer credit scores. Not all lenders adopt the latest FICO scores at the same pace, so some might still use scores that weigh medical debt more unfavorably. The three major credit bureaus—Equifax, Experian, and TransUnion—each calculate FICO scores based on information in detailed reports they keep on your credit history. Scores range from 300-850, and you have one from each of the three credit bureaus. In general terms, scores higher than 700 are considered good, while scores higher than 750 are considered excellent. Scores lower than 650 generally are considered poor, and a score lower than 600 is bad. It's important to understand, though, that different lenders have different standards, and they're all looking at different details on your credit report. For example, a score of 675 may get you approved for a mortgage, but it might be why your application for a particular type of credit card was rejected. The timeliness of your bill payments accounts for 35 percent of your score. This is a simple question of whether or not you pay your bills on time. If payments are late, are they 30, 60, or 90-plus days late? Have any accounts been sent to collections? Have you had any bankruptcies or foreclosures? The more negative marks you have and the more severe they are, the more your score will be impacted. The amount of debt you have accounts for 30 percent of your score. The important thing with this factor is your credit utilization ratio. For example, your score typically will be higher if you use no more than about 30 percent of your available credit. For example, if you have credit cards with combined limits of $10,000, your score will be higher if you keep your combined balances to no more than about $3,000. The age of your credit accounts for 15 percent of your score. Basically, how long have you had your accounts? If you've been using credit for decades and doing so responsibly, you'll have a higher score than someone with a very short credit history. It is why it's a good idea to keep credit card accounts open even if you no longer use them. The number of recent credit applications you've submitted accounts for 10 percent of your score. If you apply for credit frequently, you'll be seen as a risk, and you'll have a lower score. The thought behind this is that if people are seeking greater amounts of credit, they might be suffering from cash flow problems, which makes them riskier. The types of accounts you have accounts for 10 percent of your score. The greater the mix of accounts you have, the better your score will be. 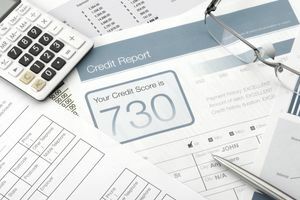 You can check your FICO scores from the three major credit bureaus by visiting myFICO.com. Some banks, credit unions, and credit card issuers include a free FICO score with your monthly statement.